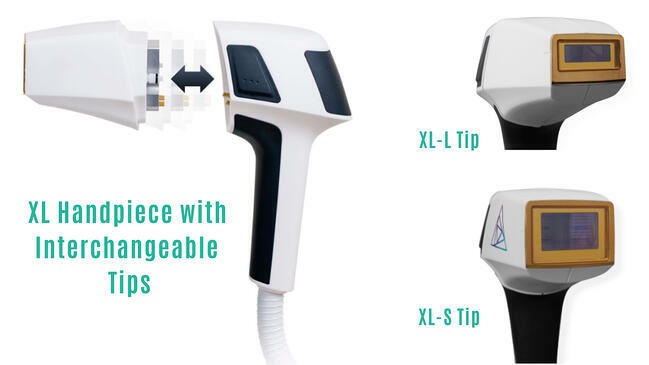 The ReSmooth XL handpiece is the most effective solution for quick laser hair removal because of its industry-leading spot-size of 9.1 cm2. This allows practitioners to treat larger areas of skin at a time, decreasing treatment time and ultimately increasing the number of patients they can see in a day. In addition, the ReSmooth features dual wavelengths (810 nm and 940 nm) that make it possible to target the deepest hair follicles, stunting hair growth at the root. The XL-L and XL-S tips also use an integrated cooling system, prioritizing patient comfort throughout the treatment process. The Astanza ReSmooth diode laser features various interchangeable handpieces that allow practitioners to treat all of their patients for lasting hair removal - regardless of skin tone or hair type. Practitioners also have the option to perform non-invasive vascular treatments using the VAS handpiece. "Our clients have seen an increase in patients coming through their door for laser hair removal since employing the ReSmooth," said Brian Hasenbauer, VP Marketing. "Not just because the treatment is growing in popularity, but because they now actually have the capacity to treat everyone effectively and efficiently." The Astanza ReSmooth has helped countless Med Spas grow their business by expanding their reach in laser hair removal and offering treatments to patients who previously believed laser hair removal wasn't an option for their skin/hair type. For more information on the Astanza ReSmooth fill out the form on this page or contact your Astanza Representative!